Another event! In the great Easter event in Cats Empire, you can collect nice rewards and design your yard with a cute bunny cat statue you can level up by playing the game! The maximum visual level of the bunny cat statue is 10. Until level 10 the statue changes its appearance with every level. You can increase the statue level by collecting rarities while raiding enemy yards. The rarity items are different for each event in Cats Empire. For Easter event you need to collect eggs. You will be rewarded with eggs, if you enter the second and third room of an enemy yard. To enter the second or third room, you need to find keys. Keys are hidden in fish piles, or inside a cat's pocket. 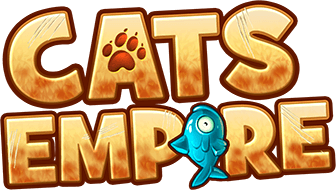 If you use the scanner item, you can find out which cat or fish pile hides the keys in each room. Or just try your luck and find the keys by yourself! Once you have collected enough keys for the next room to be opened, visit the next room by clicking on the yellow arrow on the right side of the screen. You will be instantly rewarded with your rarities and they will be automatically added to your statue progress. With events, you also have the opportunity to collect a nice costume set. Of course, for Eastern it is a 3 piece bunny costume: An Easter suit, a bunny nose, bunny ears and fluffy shoes! Cats always go in style! Event costumes grant up to +20% tournament points for each piece (up to a toal of 60%) and additional boss damage for the shoes, so you should focus on playing even more during events!